Online investors can buy individual bonds using a mainstream online broker, that let investors buy bonds directly from the borrowers. They can also deal directly with brokers that specialize in bonds. Finding and buying an individual bond online is very similar to finding and buying an individual stock. It’s up to you to find the bonds that have what you’re looking for in terms of risk and reward. Yahoo! Finance’s Bond Screener: Yahoo!’s bond screener first asks you whether you’re interested in buying a Treasury, a zero-coupon Treasury, a corporate security, or a municipal security. (If you’re looking for a municipal bond, you can also indicate what state you’re interested in.) You can narrow your search by other factors, ranging from the bond’s price, coupon, yield to maturity, and credit rating. After you enter what you’re looking for, click the Find Bonds button to get a list of all the bonds that meet your standards. Click a bond and write down the name of the issuer, coupon, and maturity date. You need this information to buy the bond. Just click the button for the type of bond you’re interested in, wait for a page to appear, and then enter all your search criteria into the appropriate text fields. When you’re done, click the Search button, and you see the list of bonds that make your cut. Write down the name of the issuer, coupon, and maturity date. 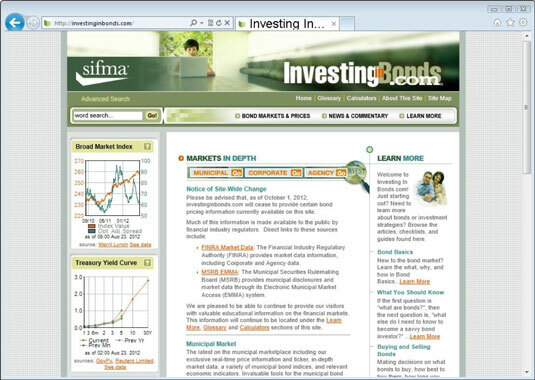 Online brokers’ sites: Most of the large online brokers—including Charles Schwab, Fidelity, TD AMERITRADE, and E*TRADE—provide bond-screening tools on their sites. Check with your online broker to see whether it has a feature that lets you screen for fixed-income securities. Bond screeners tell you what the all-important yield to maturity of a bond is. This is a great tip because it saves you and your calculator the hassle of measuring the yield to maturity yourself.